Mares tail, also called horsetail and scouring rush, can poison your horse in a similar fashion to bracken fern. 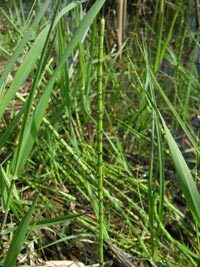 The term ‘scouring rush’ is used based on the historical fact that the coarse stems were used to effectively scour dirty cooking pots. 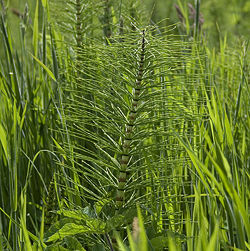 Mares tail has a high concentration of silica in its tissue and sixteenth century Europeans used these scouring reeds to scrub pots and polish furniture. Native Americans and pioneers used mares tail to clean cooking utensils; some camping enthusiasts still use it for that purpose. Mares Tail is a Herbaceous, perennial, leafless plant with a hollow stem that readily separates at the nodes. Fertile stems are un-branched, and are tipped by a cone-like structure containing spores. The plant contains Thiaminase, which is the suspected toxin and also contains aconitic acid, polustrine and silicates. Mares Tail is rarely eaten except when dried in hay, but all species should be considered potentially toxic to horses. 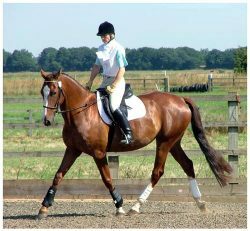 Most poisoning occurs when the mare’s tails or horsetail is cut and incorporated into hay which is then fed to horses and other livestock. Horsetail or Mares Tail, Equisetum Palustre should be the equestrians public enemy number one. I’d recommend NOT digging mares tail out until it is dead for sure. Otherwise it just starts springing up from the root cuttings. Drying or drowning the roots prior to composting is a must. In spring, brown green shoots appear with small cones at the tips that produce spores, millions of them, and it grows away from creeping thin brown roots that you can hardly see as they are soil coloured. Digging out mares tail roots is not feasible as they go down into the soil for up to 1.5 metres ? yes, 5 feet. Later the leaves or tails appear. These will die off as Autumn turns to Winter and the roots sit there waiting for spring. Mares Tail leaves have a waxy coat, which makes the plant highly resistant to weedkillers. Crushing the leaves to break up the coating helps weedkiller to penetrate and become absorbed but in large areas it is not so easy to crush all the leaves. However, glyphosate weed killer will have an effect and eventually kill the plant. You will probably need 5 or more applications. Knock it back, wait until it re-grows and then repeat. It’s doubtful you can clear mares tail in one season. Never touch Mares tail with a mechanical cultivator. If you do you will quickly understand why it has been around for 60 million years. You can read salmeterol india all about how it works in your..